This brief article will look at the human trait of “confirmation bias,” the main cause for the evil in America and in the churches in America. First, the article explains the term; then it touches on its significance in the courtroom, in the news media, and in churches. Finally, the article speaks of those believers who overcome their “confirmation bias” tendencies to one degree or another. Anyone who is politically, economically, socially, and/or spiritually active and alert in American society will learn that many interpret all facts to confirm to what they already believe. I began to learn about this tendency in high school when I saw the mainstream media selectively quoting Republican candidate Barry Goldwater in their attempt to assure his defeat. My education on this matter continued, and by the time I entered law school in 1990, I understood the bias and employed that knowledge in jury trials, including my first jury trial. Psychologists call this prejudice “confirmation bias,” a term to which I was recently introduced at a Robert R. Swafford seminar. Mr. Swafford, an attorney and jury selection expert, founded “Strike for Cause Jury Consultants,” and he teaches other lawyers how to get rid of those on the jury panel in a given case who will see only the punches made by the opposing side which support the juror’s preconceived prejudices. A trial lawyer wants jurors who will only see his punches. Any truly good lawyer knows that he does not want a “fair and impartial jury;” indeed, a fair and impartial jury is something which is unattainable because of, among other things, confirmation bias. When a juror has a confirmation bias contrary to that which a lawyer desires, the lawyer must realize that he is not going to change that bias by education or persuasion, especially in the short amount of time he has to deal with a panel of many potential jurors. He must be able to spot undesirable jurors and eliminate them for cause in a very short frame. Why? Because giving such persons more facts does no good. Giving them more facts does not change their mind, but gets them more entrenched since it challenges their world view. So trying to disrupt someone’s world view is not going to help. 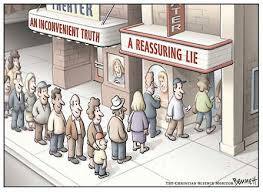 What one believes to be “truth” is one’s reality, so one acts exactly as he thinks the world is. So how does the lawyer get rid of undesirable jurors? First, he must identify the hot-button issues (issues that create an emotional response). 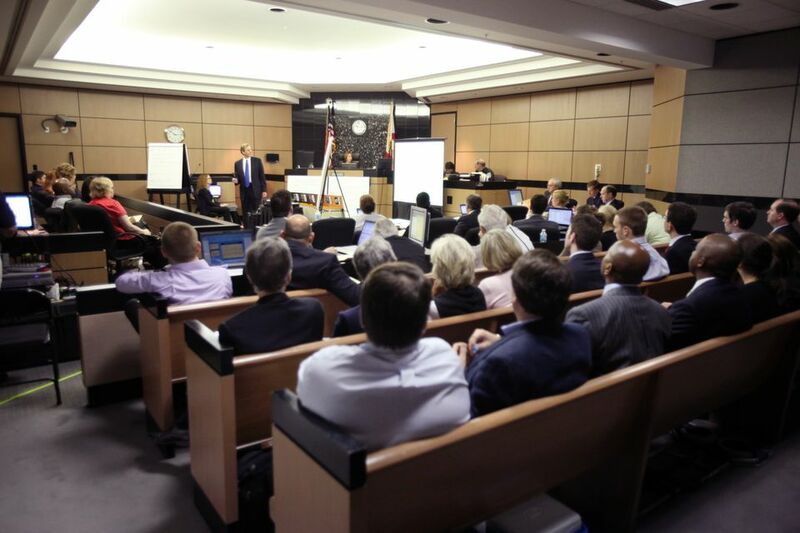 Many jurors do not make up their mind rationally. They make up their mind based upon emotion, then go back and nonsensically justify their verdict. Second, ask questions which elicit biased responses into the record so that a challenge for cause (a challenge presented to the judge which unquestionably shows a bias of a juror which will cause the juror to decide the case on something other than the facts as applied to the law). That way, in case of a negative verdict, if other procedural requirements are met which support a challenge for cause, a judge’s error in admitting the unqualified juror can be presented on appeal as a basis for a new trial. 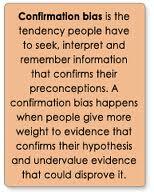 Confirmation bias occurs not only in the courtroom. Every news reporter has confirmation bias to one degree or another. 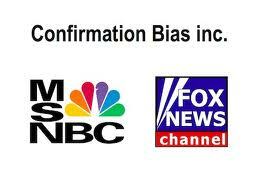 The bias of liberal media is so obvious to this writer that he simply has not consumed news from some sources for many years; for example, MSNBC, CNN, ABC, NBC, CBS, FOX, The Austin American Statesman and most other newspapers, Time Magazine, Newsweek Magazine, etc. He no longer wastes his time listening to some “conservative” sources: Sean Hannity, Laura Ingraham, Glen Beck and some others. He had enough information to know not to listen to Bill O’Reilly, Howard Stern (of course! ), and others, and he has never listened to them. Certainly, one can get some facts (along with a lot of inaccuracies) from those sources, but the facts are selected, slanted, denied, and lied about, all with the goal of supporting the bias of the source. Sadly, the author has discovered that confirmation bias is also rampant among most pastors and other members of churches with whom he has dealt. Usually, the pastor is able, because of his position, to transfer his bias to the church members; but influential church members (most significantly those with money) sometimes coerce the pastor to accept their bias. That this occurs in churches is tragic because, of all places in the world, the head of the church, Jesus Christ, makes clear in His word that truth is of utmost importance for believers. Only the knowledge of the truth will make us free (John 8.32; all Bible verses referred to are from the King James Bible). God’s word is truth (John 17.17, Colossians 1.5, 1 Thessalonians 2.13). God desires that the believer be guided by the knowledge, understanding, and wisdom gained from the truths found in his Word (2 Peter 1.1-14; Hosea 4; for more on this go to the following link: After Salvation Page of “Separation of Church and State Law” blog). One area of church matters which almost all “fundamental Baptist pastors” have a severe confirmation bias is in the area of church organization. Their religion has trained them to simply accept the tradition of their church affiliation that local churches should become a legal entity such as an incorporated 501(c)(3) religious organization. 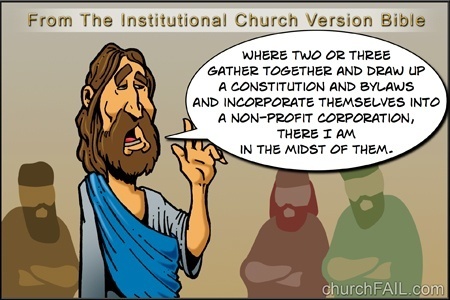 The false reasons given for church incorporation are thoroughly analyzed in the Separation of Church and State/ God’s Churches: Spiritual or Legal Entities? and in Section VI of the book God Betrayed/Separation of Church and State: The Biblical Principles and the American Application (Click here to go to ordering information, free PDF’s and online versions of all books by Jerald Finney). Truth teaches that a church grieves the Lord when they become any type of legal entity and when they get the Internal Revenue Code Section 501(c)(3) status. The writings of this author prove that a principle in the Bible is separation of church and state and that church legal entity status (incorporation, unincorporated association status, charitable trust status, Internal Revenue Code Section 501(c)(3) status, etc.) violate that principle and grieve the Lord. However, many born again elders-to include pastors-and other believers and “Christian” lawyers are guided by another “truth,” a truth advanced by their adversary, which is kinder (they believe) to their earthly security and well-being. As a result, even when such a church member will address the issue of incorporation and 501(c)(3) status for a church, he employs all the anti-biblical, anti-truthful, and anti-factual techniques and arguments he can muster up in order to justify his preconceived position. A good example of confirmation bias by a Baptist education leader, the Executive Vice-President of Landmark Baptist College, is given in the article “Spurious rationale for church corporate-501c3 status: One’s convictions.” That article analyzes the simplistic and totally false reasoning of Dr. Charles Brown, the president of a Baptist College, someone from whom one would expect at least a semblance of scholarship on the issue. “Dr.” Brown’s shallow philosophy exemplifies that of many Baptists who justify a tradition of their religion as they speak according to their confirmation bias. But thankfully, there is always a remnant. Elijah learned this. Elijah complained, “I have been very jealous for the LORD God of hosts: for the children of Israel have forsaken thy covenant, thrown down thine altars, and slain thy prophets with the sword; and I, even I only, am left; and they seek my life, to take it away” (1 Kings 19:10). God replied, “Yet I have left me seven thousand in Israel, all the knees which have not bowed unto Baal, and every mouth which hath not kissed him” (1 Kings 19:18; for more on the remnant go to “Topical Index” and scroll down to “Remnant.”). During the captivities of Israel, the remnant appears in Jews like Ezekiel, Daniel, Shadrach, Meshach, and Abednego, Esther, and Mordecai. At the end of the 70 years of Babylonian captivity it was the remnant which returned under Ezra and Nehemiah. At the first advent of our Lord, John the Baptist, Simeon, and Anna who “spake of him to all them that looked for redemption in Jerusalem” (Luke 2.38) were among the remnant. During the church-age the remnant is composed of believing Jews and Gentiles. Many of these have, do, and will undergo martyrdom. Many of the Psalms express, prophetically, the joys and sorrows of the tribulation remnant. God always calls men who will be true to him and who will preach the truth. Haggai, Zechariah, and Malachi were prophets to the restored remnant in Israel after the exile. Likewise, many men of God have taken up the cause of preaching the truth in the church age; those include the apostles, many of the early church members and preachers, and martyrs and true believers since the beginning of the New Testament churches (See The Trail of Blood of the Martyrs of Jesus and The Trail of Blood Continues). The remnant will stand for and suffer for truth. “And it shall come to pass, that in all the land, saith the LORD, two parts therein shall be cut off and die; but the third shall be left therein. And I will bring the third part through the fire, and will refine them as silver is refined, and will try them as gold is tried: they shall call on my name, and I will hear them: I will say, It is my people: and they shall say, The LORD is my God” (Zechariah 12.8-9). 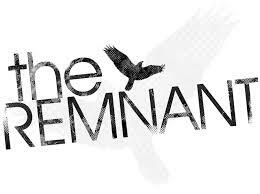 The Lord of the remnant is God, not the state, not the federal government, not their wallets or bank accounts, not their businesses, not any other person or thing. Thessalonians 2:13: “For this cause also thank we God without ceasing, because, when ye received the word of God which ye heard of us, ye received it not as the word of men, but as it is in truth, the word of God, which effectually worketh also in you that believe”.